The wide-eyed rookie cop quoting provisions of the law, is paired with a trigger-happy encounter cop, and the result is an interestingly structured film,Monsoon Shootout, directed by Amit Kumar. Having done the festival rounds since 2013, the film gets a release now, probably because of the reshuffle caused by the Padmavati postponement. Also, now Nawazuddin Siddiqui is a multiplex star, though the lead actor Vijay Verma’s career has not quite taken off. The format the film follows is reminiscent of Krzysztof Kieslowski’s Blind Chance and Tom Tykwer’s Run Lola Run—in which a small change in perspective alters the narrative. 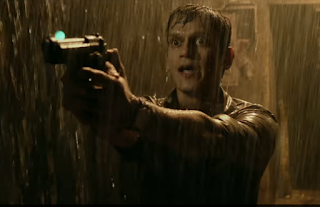 In Monsoon Shootout, on his first day at work, Adi (Verma) is reminded of his father’s belief that in every situation there is a right way, a wrong way and a middle path. And he has to pick one in his line of work. Adi has to pass his field trial under the watchful eye of Inspector Khan (Neeraj Kabi), who is the kind who shoots first and asks questions later. If Adi has to fit into this cynical and amoral system, he has to prove his ‘manhood’ or be confined to a desk job forever. The man they are stalking is an axe-wielding psycho Shiva (Siddiqui), who is suspected of having killed a builder on the orders of a slum lord. On a rainy night, after a stakeout, Adi has Shiva cornered in a dead end street. The film then sees this incident from three points of view, depending on what decision Adi takes in that split second—to shoot or not to shoot. Around this dilemma is the usual noir film cast of gangsters, hookers, corrupt cops and politicians, a wife, a kid and innocent girlfriend, who may or may not be impacted by Adi’s choice. On paper this must have sounded like an interesting script to work with, on screen it is a rushed, choppy hodge-podge; you can’t figure or who is who and what is what, but are taken through the grungy streets, chawls and docks of Mumbai on a ultimately meaningless journey.